Improvements to the Nexus Eazy, including overflows and bypass systems, along with simplified cleaning process will make the Nexus Eazy 210 the must have filter for 2010. The Eazy on the New Nexus Eazy 210 has been redesigned from the bottom up to provide improved mechanical filtration and ease of cleaning. The Nexus Eazy 210 is Evolution Aqua's exciting new filter system incorporating the industry proven Kaldnes moving bed coupled with the innovative Eazy mechanical filter. The Nexus Eazy 210 provides outstanding water clarity and quality, pump or gravity fed. It is extremely Eazy and "clean" to maintain, minimal running costs, requires no service parts such as foam, is designed and built to last for life as well as offering unrivalled price performance. The cleaning pipe normaly pushed tight in the centre of the unit when cleaning the Nexus has been replaced by a inovative one way valve that is now attached to the outlet of the Eazy, this has made cleaning easier, taking away the need to have the pipe bung as in previous models. The clear lid that is now incorporated to the Eazy on the New Nexus Eazy 210 will insure the correct ammount of k1 media is always maintained within the mechanical stage. This means the k1 media can not overflow either down the centre pipe or in to the middle chamber. The Stainless Steel Eazy has been totaly redesigned with more slots and touches the very bottom of the unit instead of sitting on feet. 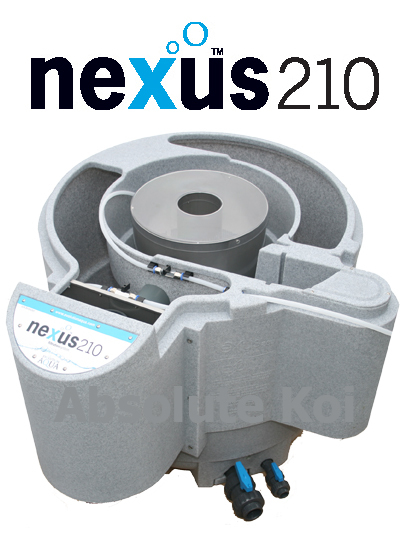 The Nexus Eazy 210 incorporates is a stainless steel vessel containing a volume of static K1 media which is located within the centre chamber of the Nexus Eazy 210 . Water enters the centre chamber and then enters the Nexus Eazy Eazy via slots in the lower half of the unit. This results in a downward flow causing many of the larger solids to settle out prior to entering the Nexus Eazy 210 . The size of the slots will not allow large mechanical waste to enter the cylinder thus acting as a first stage mechanical filtration. The water then passes through the static K1 media utilizing up and side flow and this process causes the fine solids to become entrapped. The mechanically clean water then passes to the outside chamber of the Nexus Eazy 210 where the Kaldnes moving bed is located for biological treatment prior to being returned to the pond. The Nexus Eazy 210 is extremely easy and pleasurable to clean. The water pump is switched off and an air valve is operated which diverts air from the main Nexus eazy 210 air ring into the base of the Nexus Eazy. This causes the K1 media to be agitated and cleaned vigorously. As this happens the captured particles are flushed out into the central chamber of the Nexus Eazy 210 , allowing you to see the amount of waste that has been filtered out. Once the K1 media has been agitated for a sufficient period, the water in the central chamber is flushed to waste using the purge valve provided at the base of the Nexus Eazy 210 . Once clean, the air flow is re-directed back to the main air ring and the system started again. The whole process from start to finish can take less than two minutes. The Nexus Eazy 210 Retro Kit features Evolution Aqua's new solids removal system utilising static Kaldnes. The Kaldnes is retained in a 316 stainless steel enclosure and has been proven to trap incredibly small waste particles, without disrupting flow through the system. 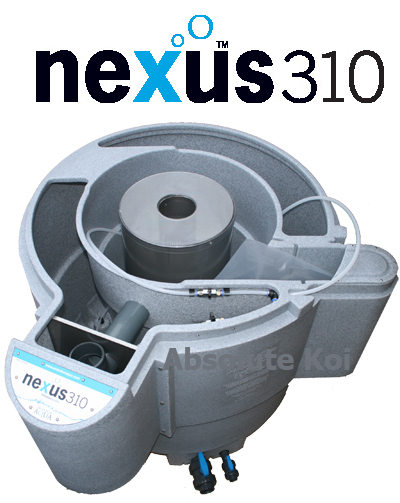 The New Nexus 310 and Nexus 210 are the latest models of the best selling Nexus range of Koi Pond filters. With a completely redesigned Eazy, giving even better clarity and simplified cleaning, along with an overflow/bypass system, the new Nexus 310 and Nexus 210 continue to be the filter of choice for the discerning Koi keeper. If you have enjoyed owning a Nexus Eazy 200 or 300, but feel you would benefit from the improvements we have made, you can. The Nexus Eazy 210 Retro Fit Kit is easily installed, and includes all the developments that we put onto a new Nexus Razy 210. This Retro Kit will only fit Nexus 200 and 300 models manufactured after June 2006. The New Nexus Eazy 310 represent's an evolutionary leap forward in the development of the world's most successful koi filter. Improvements to the Nexus Eazy, including overflows and bypass systems, along with simplified cleaning process will make the Nexus Eazy 310 the must have filter for 2010. The Eazy on the New Nexus Eazy 310 has been redesigned from the bottom up to provide improved mechanical filtration and ease of cleaning. The Nexus Eazy 310 is Evolution Aqua's exciting new filter system incorporating the industry proven Kaldnes moving bed coupled with the innovative Eazy mechanical filter. The Nexus Eazy 310 provides outstanding water clarity and quality, pump or gravity fed. It is extremely Eazy and "clean" to maintain, minimal running costs, requires no service parts such as foam, is designed and built to last for life as well as offering unrivalled price performance. The clear lid that is now incorporated to the Eazy on the New Nexus Eazy 310 will insure the correct ammount of k1 media is always maintained within the mechanical stage. The only possible compromise that owners of the original Nexus Eazy 300 faced was that the Nexus Eazy 300 could not be left without cleaning for extended periods of time. The good news is that the Nexus Eazy 310 now incorporates a gravity bypass or pump fed overflow depending on how the Nexus Eazy 310 is going to be used. This now means that the Nexus Eazy 310 user can enjoy their holiday in certain knowledge that all is well with their pond at home. The Nexus Eazy 310 incorporates is a stainless steel vessel containing a volume of static K1 media which is located within the centre chamber of the Nexus Eazy 310 . Water enters the centre chamber and then enters the Nexus Eazy Eazy via slots in the lower half of the unit. This results in a downward flow causing many of the larger solids to settle out prior to entering the Nexus Eazy 310 . The size of the slots will not allow large mechanical waste to enter the cylinder thus acting as a first stage mechanical filtration. The water then passes through the static K1 media utilizing up and side flow and this process causes the fine solids to become entrapped. The mechanically clean water then passes to the outside chamber of the Nexus Eazy 310 where the Kaldnes moving bed is located for biological treatment prior to being returned to the pond. The Nexus Eazy 310 is extremely easy and pleasurable to clean. The water pump is switched off and an air valve is operated which diverts air from the main Nexus eazy 310 air ring into the base of the Nexus Eazy. This causes the K1 media to be agitated and cleaned vigorously. As this happens the captured particles are flushed out into the central chamber of the Nexus Eazy 310 , allowing you to see the amount of waste that has been filtered out. Once the K1 media has been agitated for a sufficient period, the water in the central chamber is flushed to waste using the purge valve provided at the base of the Nexus Eazy 310 . Once clean, the air flow is re-directed back to the main air ring and the system started again. The whole process from start to finish can take less than two minutes. The Nexus Eazy 310 is available from 4th January 2010, why not order yours now to be one of the first in line for this amazing new filter. If you have enjoyed owning a Nexus Eazy 200 or 300, but feel you would benefit from the improvements we have made, you can. The Nexus Eazy 310 Retro Fit Kit is easily installed, and includes all the developments that we put onto a new Nexus Eazy 310. The Nexus Eazy 200 is Evolution Aqua's exciting new filter system incorporating the industry proven Kaldnes moving bed coupled with the innovative Eazy mechanical filter. The Nexus Eazy 200 provides outstanding water clarity and quality, pump or gravity fed. It is extremely Eazy and "clean" to maintain, minimal running costs, requires no service parts such as foam, is designed and built to last for life as well as offering unrivalled price performance. The Nexus Eazy 200 incorporates is a stainless steel vessel containing a volume of static K1 media which is located within the centre chamber of the Nexus Eazy 200. Water enters the centre chamber and then enters the Nexus Eazy Eazy via slots in the lower half of the unit. This results in a downward flow causing many of the larger solids to settle out prior to entering the Nexus Eazy 200. The size of the slots will not allow large mechanical waste to enter the cylinder thus acting as a first stage mechanical filtration. The water then passes through the static K1 media utilizing up and side flow and this process causes the fine solids to become entrapped. The mechanically clean water then passes to the outside chamber of the Nexus Eazy 200 where the Kaldnes moving bed is located for biological treatment prior to being returned to the pond. The Nexus Eazy 200 is extremely easy and pleasurable to clean. The water pump is switched off and an air valve is operated which diverts air from the main Nexus eazy 200 air ring into the base of the Nexus Eazy. This causes the K1 media to be agitated and cleaned vigorously. As this happens the captured particles are flushed out into the central chamber of the Nexus Eazy 200, allowing you to see the amount of waste that has been filtered out. 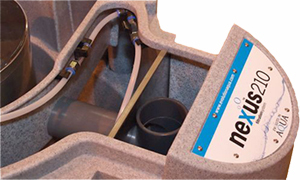 Once the K1 media has been agitated for a sufficient period, the water in the central chamber is flushed to waste using the purge valve provided at the base of the Nexus Eazy 200. Once clean, the air flow is re-directed back to the main air ring and the system started again. The whole process from start to finish can take less than two minutes. 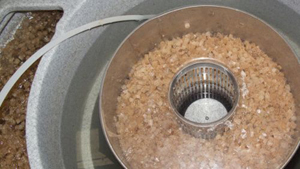 The Eazy features Evolution Aqua's new solids removal system utilising static Kaldnes. The Kaldnes is retained in a 316 stainless steel enclosure and has been proven to trap incredibly small waste particles, without disrupting flow through the system. Upgrade your existing Nexus 200 or 300 with the Eazy retro fit kit. Out with the old foam block and in with the Eazy it's that easy. Upgrade your existing central sponge block to the new Nexus Eazy. The Eazy features Evolution Aqua's new solids removal system utilising static Kaldnes. The Kaldnes is retained in a 316 stainless steel enclosure and has been proven to trap incredibly small waste particles, without disrupting flow through the system. Cleaning the Kaldnes is a simple matter of turning on the air tap to the settlement area, thus agitating the static Kaldnes. Waste is then dislodged from the media, and purged through the central vortex drain. The Nexus Eazy 200 retro kit inlcudes all the necessary parts, plus 35 litres of Kaldnes media, to upgrade your exisiting sponge based Nexus. The Nexus Eazy 300 retro kit inlcudes all the necessary parts, plus 45 litres of Kaldnes media, to upgrade your exisiting sponge based Nexus. The exit has been changed so that the fine particles are trapped in a more efficient manner and are a lot easier to clean and purge to waste. The resulting clarity is incredible! The improvement adds a full height metal plate (instead of the half plate) and a plastic weir after it. This new design utilises the whole pack of static K1. This maximises the cleaning potential and gives great results. Equally as exciting is the air backwash kit which is part of this improvement. No more sponge to rinse off. Just as easy to clean as the EAZY! Simply turn on the air valve and the cleaning process begins without getting your hands wet. For use with the NeXus Eazy 200 and NeXus Eazy 300. Additional Central Foam Cylinder Cartridges for Nexus Inlet and Foam Blocks for Nexus outlet. These Nexus Foam inlet and outlet filters were used on the original Nexus and are still available for those of you who still require them.